I asked Kate Gabrielle from Scathingly Brilliant, one of my absolute favorite bloggers, if she could do a DIY post whilst I'm busy moving - and this is what she came up with! 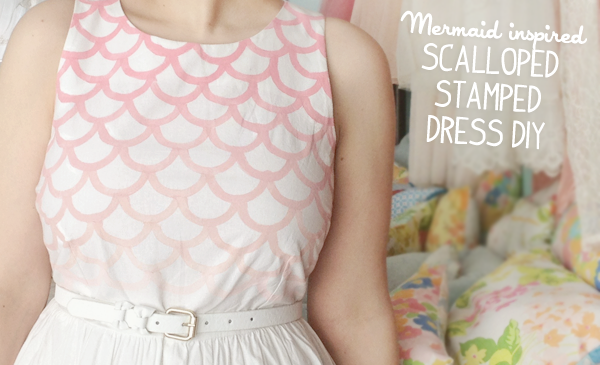 For my DIY post, I was inspired by Kailey's love of mermaids! 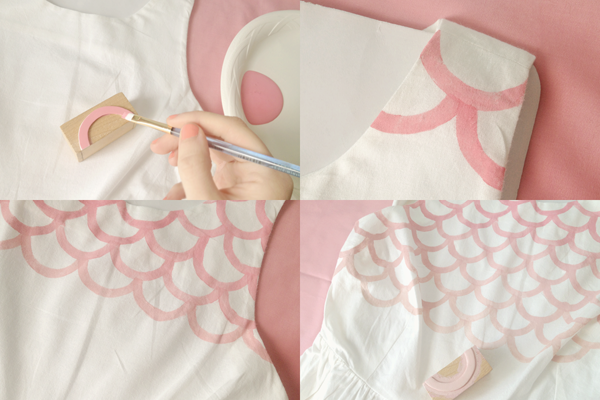 I decided to create something that mimicked the pretty scaled pattern on a mermaid's fins, and came up with this easy peasy stamped dress project! You'll need: a white cotton dress (or shirt, or skirt), two bottles of fabric paint (your main color and white), a wooden block (I stole one from my little brother's old block set), scissors, a compass, a piece of craft foam, a paintbrush and some free time. 1. With the compass, draw a half-circle onto your foam. You want it to be about the same width as the wooden block. 2. 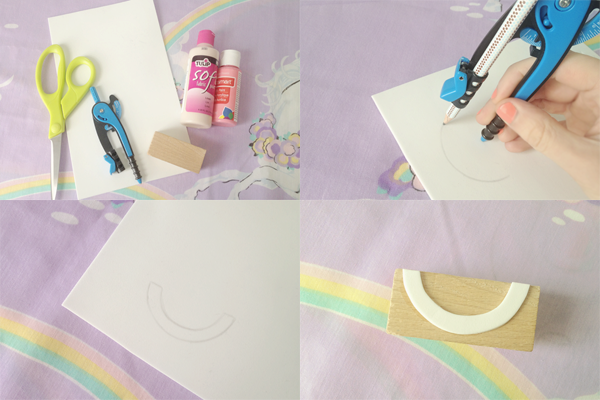 Using the half-circle as your guide, sketch in the rest of your scallop with pencil, and then cut it out. 4. Make sure you have cardboard or something under your dress so the paint won't seep through to the back side! Then put a thin layer of fabric paint on your stamp using a paintbrush. 5. Starting at the top of the dress, stamp your first scallop. Then repeat the pattern underneath, with the next two scallops meeting in the middle of the one above. 6. For each new row, mix a little bit of white fabric paint with your other color to achieve the gradient look. This was an important part of my project because I knew that I didn't want to stamp the skirt (the gathering at the waist would have just been way too tricky to maneuver!) so I wanted it to fade to white before it hit the skirt. forget to check out her etsy shop! Thank you again Kate ♡! This SO adorable and creative! Amazing Guest Post! Great DIY Work ,looks perfect! Thank you for hosting this amazing Kate Gabrielle's DIY project! Totally one of my favorite dress ever! This is a wonderful DIY and shirt! Love the colours you used, Gabrielle. Oh, intriguing :D I might try this some day. It looks amazing, I would have never guessed that print was done by hand. Such a cute idea! I would love to try this out! Really cute idea! I have this boring white tank I've been trying to figure out what to do with-- thanks for the inspiration! Oh my gosh so cute Kate! I LOVE this idea! Kate, this is lovely! :) Love it!! omg this is the cutest dress ever!! this is adorable. i want to try this with turquoise paint and a white tank top!!! this is so wonderful! i can't wait to give it a go. Oh gosh! This is gorgeous! brilliant idea and it seems easy enough for a non-crafty gal like myself. how cue is this?! i love the fade in color as i gets towards the bottom! That turned out so adorable! SO CUTE! what a gorgeous diy... and now i have found your blog and i love it! I am a big fan of mermaid and I just found your blog, I love it ! Wow, this is awesome! The scallop gradient for each row is the best part. This is so cool, how did you even make it that symmetrical? Wow, I'm super impressed with this DIY - how awesome! Also, did you check out my latest giveaway? Everyone who enters wins a $15 virtual gift card to Inpink jewelry! That is sooo freakin' cool! The end product is sooooo beautiful! Love the color. I LOVE this! I really need to give stamping clothing a try. It seems like so much fun. What a great guest post, such a fantastic idea! wow your blog is so beutifull I love love ypour blog, fallowing right n´now! So in love with this tutorial! I NEED to try this!! You guys are so inspiring, I had to make myself a mermaid dress. Love the graduating effect! Really elegant! 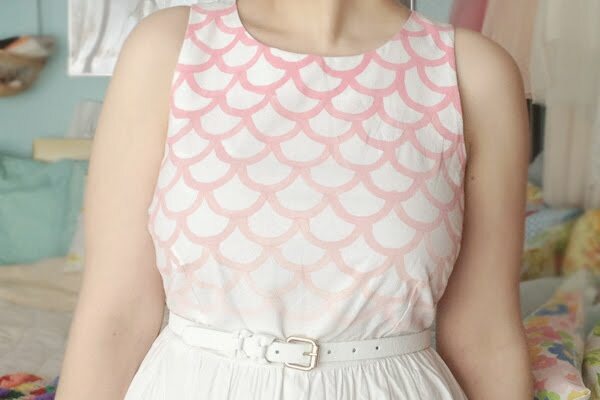 Oh, this is beautiful - I picked up a white sundress in a sale a while back that I was intending to tie dye or something, but I may end up doing something like this...maybe with a potato instead of a fancy-schmancy woodblock, but whatever. What colours would you suggest with a teal and black skirt? Cheers!